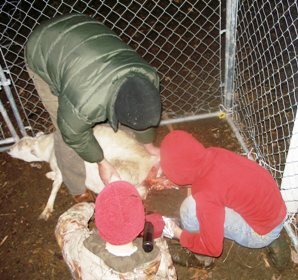 If your not interested in hearing about our experience with pulling a breech lamb, you should just skip this post. Our 12 year old has a thriving herd of 12 sheep. He bought 4 sheep 2 years ago. We’ve already butchered 2 and and lost 2 babies. Overall, we love the Katahdin sheep. They have been very easy compared to some of our other farm animals. The book says 95% of the time, sheep lamb just fine without any help. We recently had one of those 5% gone wrong experiences I don’t think any of us will forget. One of his yearling ewe’s was due to lamb and was showing obvious labor signs. The day progressed and during our periodic checks on her, it became obvious that she was in good labor but making little progress. Being of the 95% belief, we thought for sure she’d have the lamb any moment. When it became clear that she wasn’t progressing, the boys brought her down to a pen to check her out. Our 12 year old put the gloves on and checked her finding only on foot presenting. He knew that was a problem and tried to find the other foot. It proved to be a very difficult needle-in-a-haystack search, but eventually he found the other foot and leg. Even after finding the other foot, the lambs presentation was terribly wrong. Eventually, we figured out that it was completely breech and one of the legs was twisted and broke (probably from laboring in the position it was in). It became apparent that the lamb was probably already dead and that if they didn’t take more forceful, drastic measures to get the lamb out, the ewe would probably not make it either. 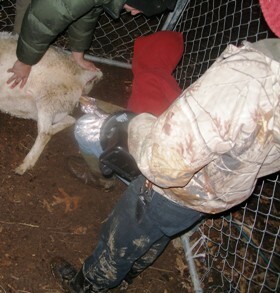 Eventually, the guys were successful in pulling the breech lamb. The baby lamb was a stillborn little ram who was terribly malpresented with a twisted and broken leg. After they pulled the lamb, the ewe was in a bit of shock and didn’t move for quite a while. They gave her a shot and some molasses water and watched her in the pen until morning. The released her out in the pasture and so far, almost 2 weeks later she is doing well. Thankfully! A couple of days later, another on of his expecting ewes, also a yearling, had a healthy delivery of twins!